AeroPanel produces panels to your specifications to meet your needs. See our Product samples shown below. TYPE III - One piece plastic panels. Panels consisting of one sheet of plastic, utilizing MS25010 lighting assemblies for illumination. TYPE IV - Integrally-wired incandescent panels. Panels consisting of one sheet of plastic, with wiring and lamps embedded within the panel. TYPE V - (Alternate) - Two piece panel assembly. Consists of plastic front sheet with attaching printed circuit board containing lamps, circuitry and connectors. 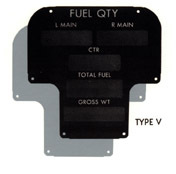 TYPE VI - Panels illuminated by electroluminescent (E-L) lamps; E-L lamps are encapsulated within the panel. AeroPanel has the capability to produce panels and other displays that are in compliance with MIL-L-85762, using either incandescent, LED or electroluminescent light sources.